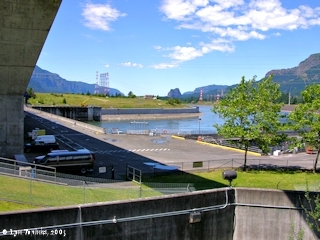 Click image to enlarge Bonneville Dam North Powerhouse. Image taken May 13, 2005. The Bonneville Dam is a hydroelectric dam located on the Columbia River at River Mile (RM) 146. 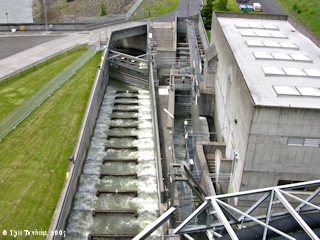 Today the dam complex is built across three islands - Robins, Bradford, and Cascade. Robins Island is closest to the Oregon shore, Bradford Island is in the middle of the Columbia, and Cascade Island is close to the Washington shore and supports one end of the North Powerhouse. Bonneville Dam was first completed in 1938. At that time the Columbia River was split only by Bradford Island. 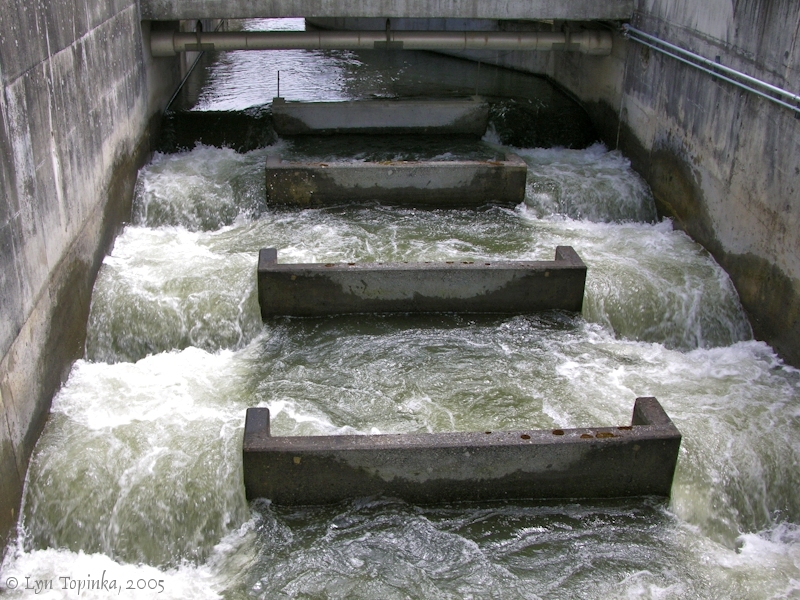 The powerhouse and locks were built on the Oregon (south) side of Bradford Island and the Spillway Dam was built on the Washington (north) side of Bradford Island. 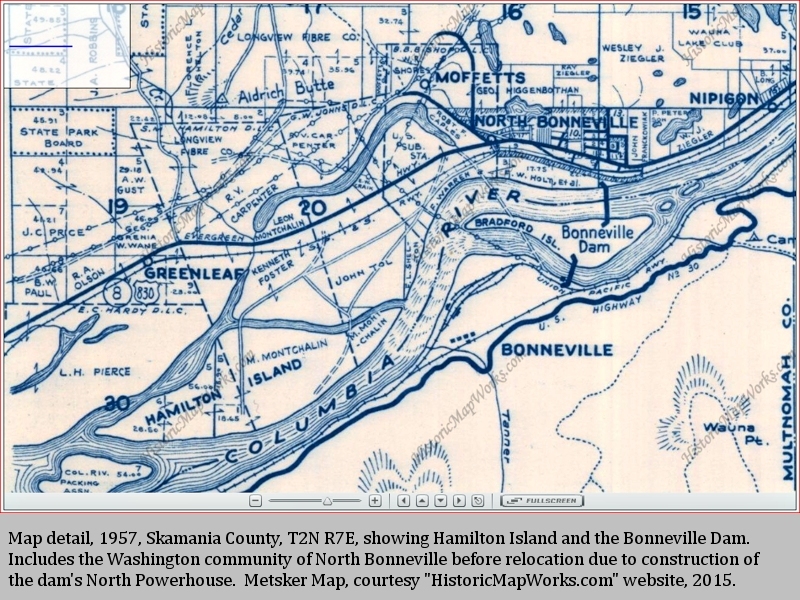 In 1982 the Columbia River was once more re-routed, Cascade Island was created, and the "North Powerhouse" was built between Cascade Island and the Washington shore. 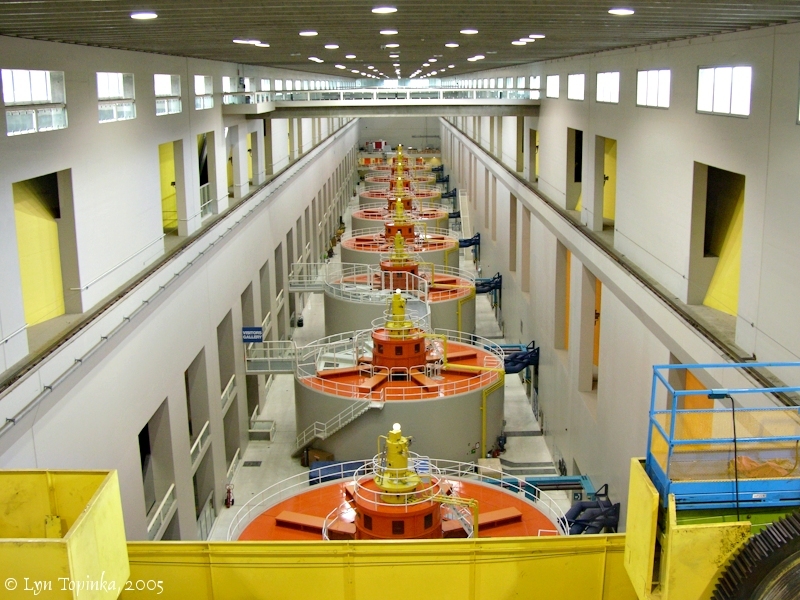 Preparation for the North Powerhouse began in 1972 with construction beginning in 1974. Part of the preparation included removal of an historic Indian Village, quite possibly the village of "four houses" seen by Lewis and Clark. The "camp" Clark refers to is their camp of October 30th and 31st which was located near Ashes Lake, at the beginning of the portage across the Cascade Rapids. The "large Island" is Bradford Island. On April 9, 1806, the main group of the Lewis and Clark expedition camped on the Oregon side of the Columbia River at Tanner Creek. One canoe however with George Drouillard ("Drewyer") and the brothers Joseph and Reubin Field failed to make landing at Tanner Creek. Istead, the three men camped on the north side of the Columbia opposite the upstream end of Bradford Island at the location of today's Bonneville Dam North Powerhouse. 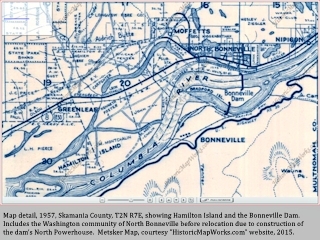 Click image to enlarge HISTORICAL MAP detail, 1957, Hamilton Island and North Bonneville, Skamania County, Washington. 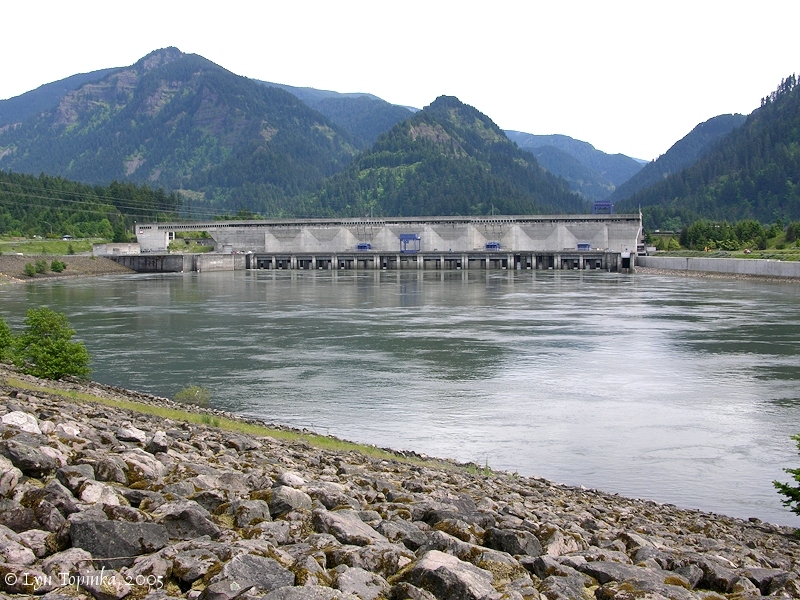 North Bonneville location before relocation due to construction of Bonneville Dam's North Powerhouse. Metsker Map courtesy "HistoricMapWorks.com" website, 2015. 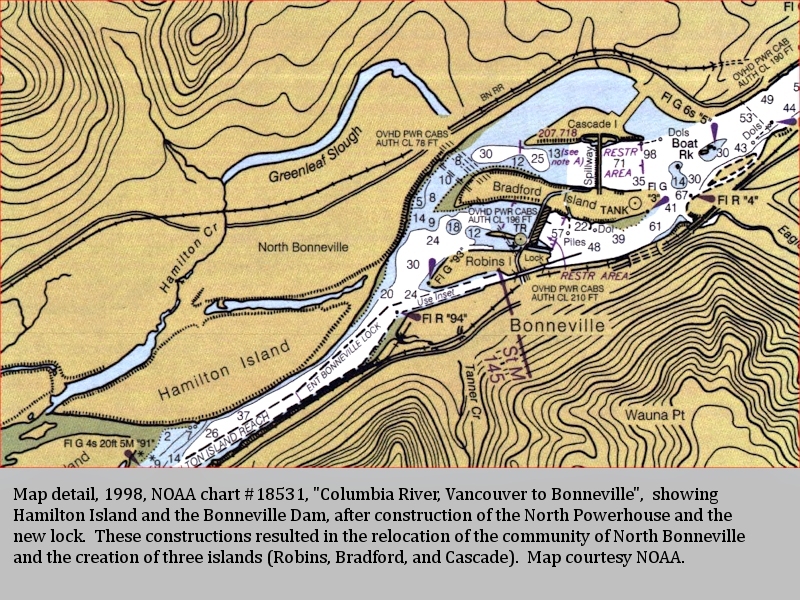 Click image to enlarge HISTORICAL CHART detail, 1998, Hamilton Island, North Bonneville, and the Bonneville Dam, Skamania County, Washington. 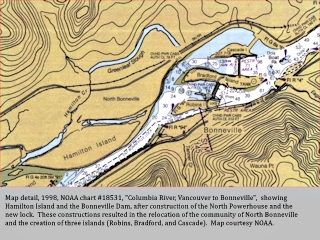 Note location of North Bonneville after relocation due to construction of Bonneville Dam's North Powerhouse, and the existence of three islands in the Columbia (Robins, Bradford, and Cascade) after construction of the new lock. NOAA Chart #18531 courtesy NOAA website. 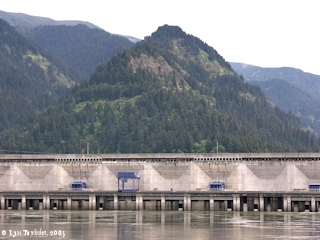 Click image to enlarge Bonneville Dam North Powerhouse. Ridge in the background lies between Ruckel Creek drainage (left) and Eagle Creek drainage (right). Image taken May 13, 2005. 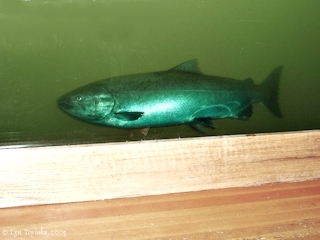 Click image to enlarge Looking downstream from Bonneville Dam's North Powerhouse. View from the North Powerhouse, Bonneville Dam, towards Cascade Island. Beacon Rock is in the distance. Image taken June 19, 2005. 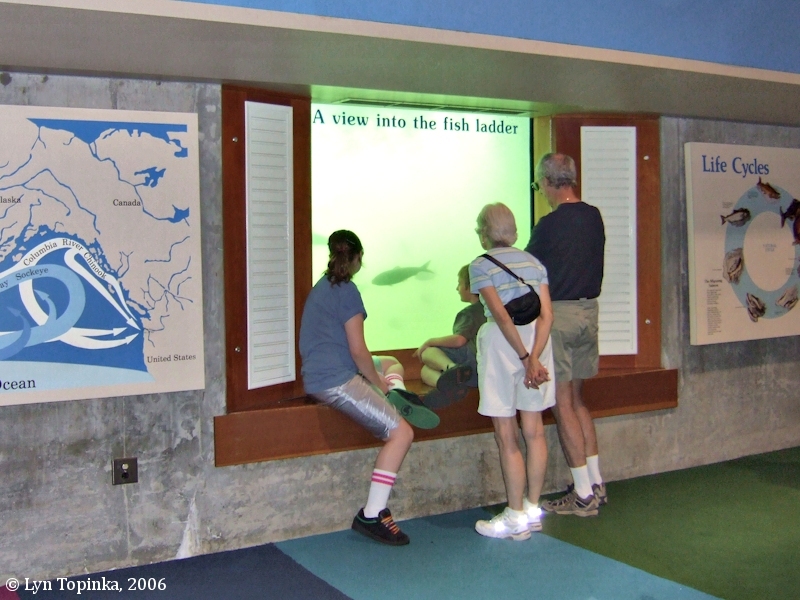 Fish Ladders exist on both sides of the Bonneville Dam, and viewing windows allow the public to view the annual salmon migration up to spawn. Click image to enlarge Bonneville Dam North Powerhouse Fish Ladder. Image taken May 13, 2005. Click image to enlarge Bonneville Dam Fish Viewing Window, North Powerhouse. Image taken July 2, 2006. 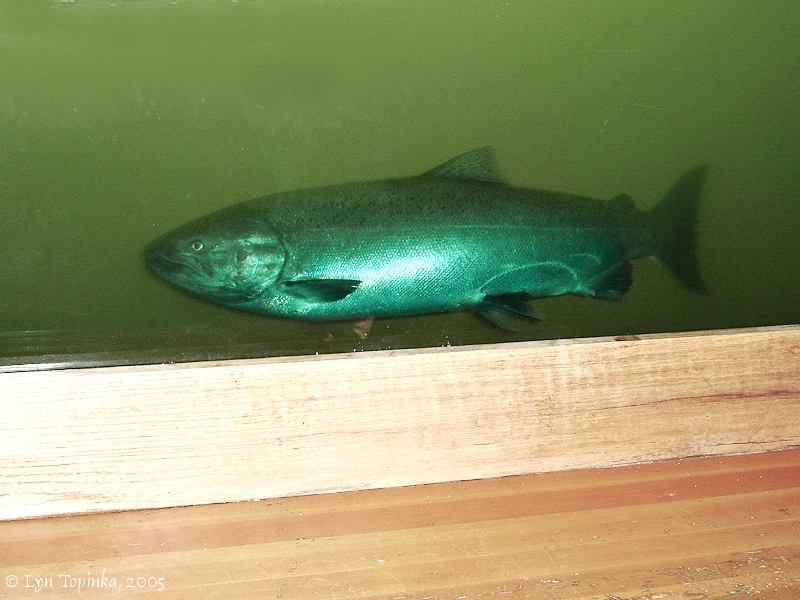 Click image to enlarge Wild Salmon, Bonneville Dam Fish Viewing Window, North Powerhouse. Image taken May 13, 2005. 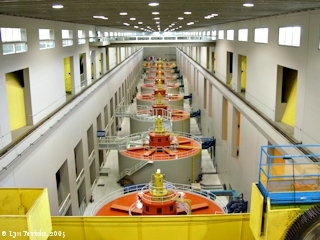 Ten Turbine Generators are located at the North Powerhouse, two of them rated 13,100 KW, and eight of them rated 66,500 KW. 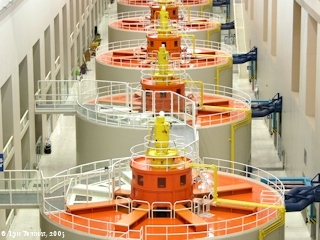 Click image to enlarge Eight Turbines, Bonneville Dam North Powerhouse. Image taken May 13, 2005. Click image to enlarge Turbines, Bonneville Dam North Powerhouse. Image taken May 13, 2005.